Part I: Framing Educational Research Inquiry to Meet Today's Realities. J.R. Levin, Randomized Classroom Trials on Trial. V.F. Reyna, The No Child Left Behind Act, Scientific Research and Federal Education Policy: A View from Washington, D.C.
D.F. Halpern, Dissing Science: Selling Scientifically Based Practices to a Nation that Distrusts Science. R.E. Mayer, The Failure of Educational Research to Impact Educational Practice: Six Obstacles to Educational Reform. Part II: Basic Issues When Addressing Human Behavior: An Experimental Research Perspective. 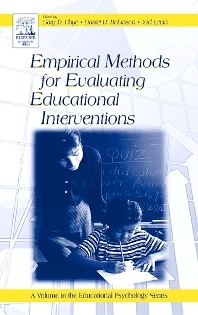 J.C. Valentine and H.M. Cooper, Can We Measure the Quality of Causal Research in Education? J. D'Agostino, Measuring Learning Outcomes: Reliability and Validity Issues. J.T. Behrens and D.H. Robinson, the Micro and Macro in the Analysis and Conceptualization of Experimental Data. Part III: Producing Credible Applied Educational Research. R. Boruch, Beyond the Laboratory or Classroom: The Empirical Basis of Educational Policy. G.D. Phye, Academic Learning and Academic Achievement: Correspondence Issues. A.M. O'Donnell, Experimental Research in Classrooms. S. Graham, K.H. Harris and J. Zito, Promoting Internal and External Validity: A Synergism of Laboratory-Like Experiments and Classroom-Based Self-Regulated Strategy Development Research. Educational researchers and administrators as well as teachers from all levels of education. University of Arizona, Tuscon, U.S.A.